Western European Trappings from 900-1600 c.e. Period horse coverings can be called by many names. Bards, Housings, Trappings or Caparisons. 1. A piece of armor or ornament for a horse's neck, breast or flank. 2. To furnish with bards. 1. a. An ornamental covering for a horse. 1. An ornamental cover for a saddle. To adorn with or as if with trappings. 2: Outward decoration or dress: ornamental equipment. I leave it to you to choose the one you like. I have divided bards into three basic categories, open, full coverage and extended blanket. Up until the about 1100 Bards as we think of them weren't really used. They would decorate their tack, sometimes quite elaborately, but full coverage bards hadn't been invented yet, and "open" style was really functional. I have included some pictures of Greeks, Romans and others to give an indication of what they did. Open generally, is a decorated or decorative breeching and breast collar, with or without decorated bridles and reins. Exactly where decoration ends and functionality begins is an open question. All of the decorative open bards may have been functional, or only some may have been. Full coverage may cover the head and neck or not, but usually covers the rump and flanks and the shoulders of the horse. Sometimes the front parts cover the legs of the rider as well. f. Probably the most famous bards. Luttrell Psalter, c 1340. Geoffrey Luttrel armed for war with his wife and daughter. Note arms on front and back bards, chanfron and saddle. Note linings are contrasting color. i. Ulrich Von Lichtenstein c.1300 Codex Manesse, Heidelberg. An extended saddle blanket may either be a slightly large blanket with a fancy edging or a wide strip of cloth across the back of the horse, which can extend as far as the ground. Extended saddle blankets are often combined with open bards of various types. Of course, the various kinds of bards could be used by different people at the same "event" or by the same person at different types of events. It is common to see Knights jousting with full coverage bards on their horses and the various "helpers" with open or no bards at all. Folk rarely used full coverage bards when hunting. Of course, there are plenty of pictures out there where the horse is wearing no bards or other decorative trappings of any kind. u. Detail of a 15th c painting depicting a war scene. 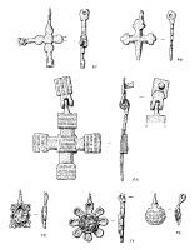 Metal ornaments were frequently used on tack through the Middle Ages. They took two general forms: round or rectangular studs, now known as "spots" in draft horse circles, and pendants. 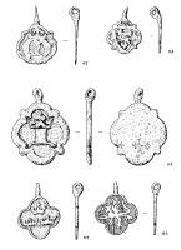 Some examples of pendants are shown here. Want to try making some?